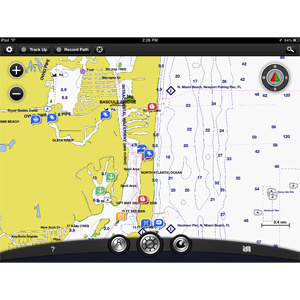 Get the same feature-rich and highly accurate BlueChart navigation available for your chartplotter right on your iPad. View shaded depth contours and inter-tidal zones with spot soundings from home. Plan your trips around marina points of interest and slipways. Acquire weather through cellular-based Apple devices and see weather conditions, temperatures, dew points, wind direction/speeds, radar and cloud cover overlaid on the chart. BlueChart Mobile gives you the same object-oriented data and seamless chart presentation you’ve come to expect from your networked chartplotter. Interact with the map on your iPad or iPhone by using the radial menu to mark waypoints, establish a destination for your route or learn more about the features on the map. Search through BlueChart services and ActiveCaptain™ marinas for a marine service point and find the phone number, hours of operation, and amenities and services available. With the touch of a finger, view tide station and current prediction information. 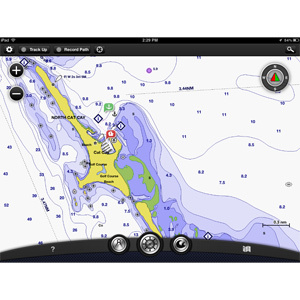 When on board, wirelessly connect your Apple device to your networked chartplotter and transfer your routes, waypoints and tracks between your iPad or iPhone and chartplotter. 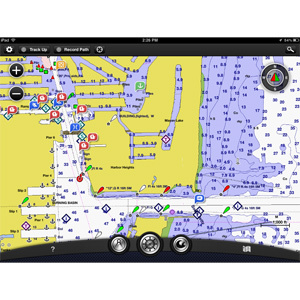 Once underway, “follow the boat” along its route on your iPad by wirelessly sharing the GPS location from the marine network. 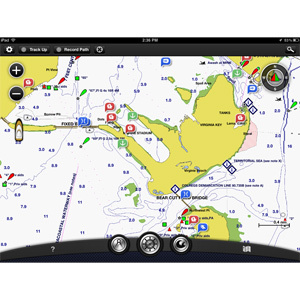 This is the most accurate way for passengers to see the boat’s progress and position from anywhere on the boat when the Apple device’s assisted-GPS is unavailable. Use BlueChart Mobile with ActiveCaptain, a web community that provides real-time content generated by mariners. Read and write reviews about marinas, shared local boating knowledge, anchorages and hazards. More than 200,000 boaters write reviews and update the information on ActiveCaptain, with more users joining all the time. 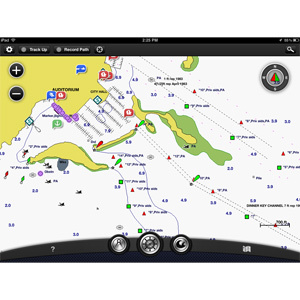 Available on the App Store, download Garmin BlueChart Mobile for free. 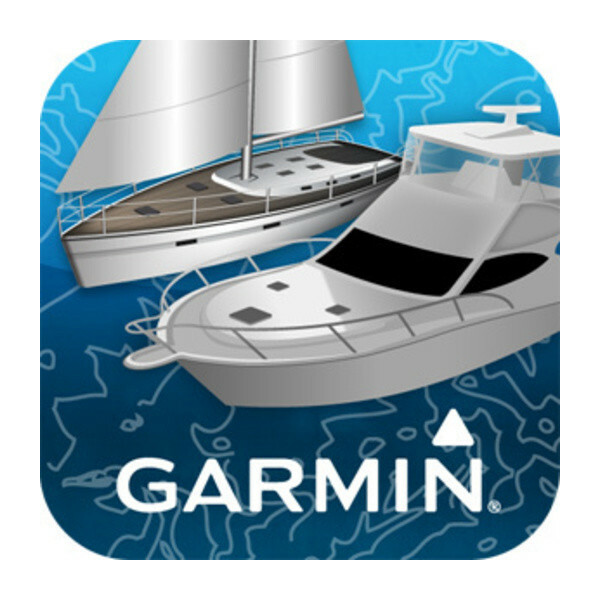 Once the application is downloaded to your compatible mobile device, use the "In-App" purchase process to go to the Garmin store and purchase BlueChart maps or Premium Weather. Charts are available for the world, broken down into 9 regions. Select and pay for the region that best suits your boating needs; or purchase the Premium Weather option to purchase the subscription that works for you. ¹Weather data can stream wirelessly to GPSMAP® 8xxx/7400/7600/8x0/10x0/7x1/5x7 series. All other BlueChart Mobile features are also compatible with GPSMAP 4/5/6/7xxx series through the optional Garmin Wi-Fi® Adapter Kit (sold separately). iPad, iPhone and Apple are trademarks of Apple Inc., registered in the U.S. and other countries. App Store is a service mark of Apple Inc. Wi-Fi is a registered trademark of the Wi-Fi Alliance. iPhone, iPod and App Store are trademarks of Apple Inc.
Greenland/Iceland: Greenland coast, Iceland, the Shetland Islands and the Faroe Islands including Reykjavik, IS; Scalloway, UK and Torshavn, DK. Northern Europe: Scandinavia, the Low Countries, central Europe and western Russia. Coverage includes the Kattegat, the IJsselmeer, the Baltic Sea, Lake Ladoga, the Rhine, Volga and Danube Rivers, major canals and the Gulfs of Bothnia, Finland and Riga. Northwest Europe: British Isles, the coast of Western Europe from Amsterdam to Monaco, the Strait of Gibraltar, the Balearic Islands, the northwestern coast of Africa, the Canary Islands and the Azores. Mediterranean: French Atlantic coast, the Iberian Peninsula, the entire Mediterranean Sea, the Black Sea, the Bosporus and Dardanelles, the Suez Canal, the Strait of Gibraltar, the Canary Islands and the Azores. Australasia and Africa: Africa (excluding the Mediterranean coast), Arabian Peninsula, Persian Gulf, India and Sri Lanka, South-East Asia, Indonesia, Australia, New Zealand, China, Taiwan, South Korea and numerous Micronesian and Polynesian Islands. Australia and New Zealand: Australia and New Zealand including Tasmania and the Great Barrier Reef. South America: Mexico from Puerto Vallarta south through Central America, the Panama Canal, the entire coast of South America, the Yucatan and the Caribbean Sea. Includes the Hawaiian Islands, the Falklands and the Amazon River Basin. North America: Both U.S. coasts, the Great Lakes, major inland rivers, Alaska and Hawaii. Also included are both Canadian coasts, Mexico and Central America, the Panama Canal, the Caribbean and the northern tip of South America. U.S.: Both U.S. coasts, including the Great Lakes, Alaska, the Hawaiian Islands & major inland rivers. Coverage includes the Bahamas, the Turks & Caicos Islands, Puerto Rico and the Pacific coast of Canada. LakeVü coverage is not included.